Making a card with the Iris Folding Technique can give you a spectacular result. If you have never made a card using this paper folding technique, it looks a lot more complicated than it actually is. It's pretty easy to learn how to do this. See below for my step-by-step tutorial. In this example, I have used a square shaped aperture, but there are many other patterns. I will provide a link to some for you at the bottom of the page. A card blank with a window aperture. 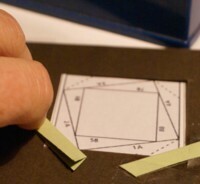 Create the aperture with your paper trimmer or with a craft knife and steel ruler, or use a Big Shot die to cut one. A craft knife and cutting board or a large square punch or a paper trimmer. 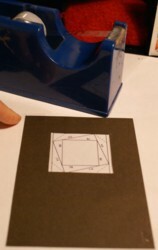 A plain piece of cardstock to punch or cut a slightly smaller square aperture from to use as a frame inside the main aperture. 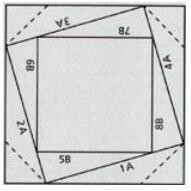 A square pattern for your folds. Repositionable adhesive for the pattern. Adhesive for the paper strips. Some clear packing tape for the completed design. Some backing paper or cardstock for the completed aperture. Four different types of thin paper to make your folds (or you can use unfolded cardstock, ribbons, origami paper, etc - as long as it is thin) in contrasting or coordinating colours and/or patterns. A bone folder can be handy if you are going to be folding your strips of paper. Cut or punch your main aperture, and make a smaller aperture from the second piece of cardstock. Adhere the two layers together. Position the pattern over the right side of the aperture so you can see it from the wrong side. Use the non permanent adhesive to fix the pattern in place. 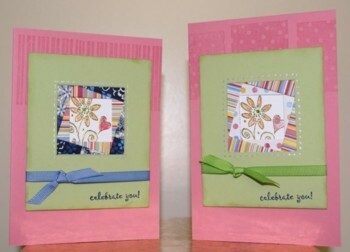 Cut 1" strips out of the thin paper (or 1/2" strips of cardstock) - four of each colour. 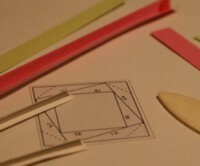 Fold the 1" papers in half and make sharp creases of the folds with the bone folder. You can use ink to edge the 1/2" piece strips of cardstock if you like. 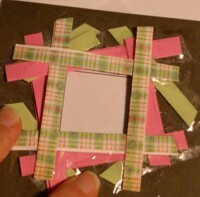 Using the pattern guide, start placing the strips of paper around your aperture and adhere them in place. Trim the ends of the paper to a reasonable length. You can keep going till you completely fill the aperture, or stop short of filling it and place a special image in the middle (like a small picture or a stamped image), or glitter paper or other embellishment. Do You Get Your Free Copy Of Paper Twists? Use the packing tape to fix your folds firmly to the cardstock from the back of your design. This will help hold the folds in place and make it flatter too. 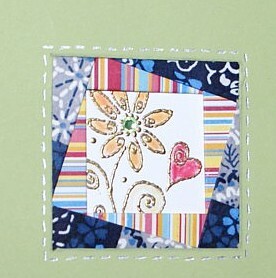 Adhere the backing cardstock to the design. Use your amazing image on a card front any way you wish but be sure to find someone to 'wow' with your lovely iris folds when you are done. Use foils or glittery papers in your desig. Try using Washi Tape to make a design. The pattern will probably show through the translucent tape though, so try overlapping the strips carefully. Try using origami papers or rice papers to make your paper folds. 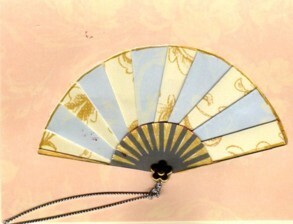 Use vellum strips to make a translucent design. Incorporate this technique into your scrapbook pages. Use embossing powder on the edges of the paper folds to add interest, or stamp and emboss the stamped images as I have done in the series of Iris Fold Fan Cards in the slide show at the top of the page. If you have tried this technique and have a project to share, please do. I would love to see your projects. If you would like to have more iris folding templates, you may like to purchase this book. And if you like fancy folded card ideas, you might like to see the gatefold card technique, or the origami fox project.